Many of us are aware that the modern diet we commonly have here in America is a bit off. Either because of the amount of pesticides we use for our crops, or because of the sheer dependance we seem to have on overly processed foods. However, many of us also don't follow these thoughts to the deficiencies that this diet causes. 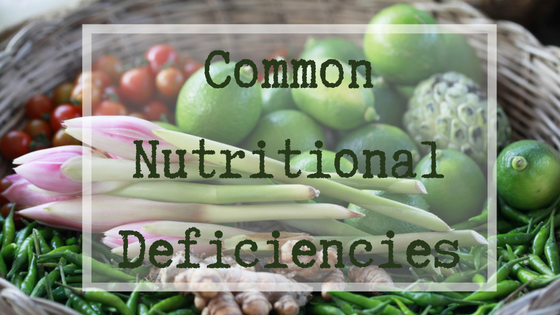 So I decided to share with you a few common nutrient deficiencies we are seeing here in modern America. Iron is essential to good health. It's one of the main components in red blood cells, and is what binds with hemoglobin in order to transport oxygen to cells. It also helps to regulate cell growth and differentiation. Women of childbearing age are particularly prone to iron deficiencies, or anemia, because of their menstrual cycle. However preschool aged children, vegetarians and vegans, as well as pregnant women are also susceptible. Iron deficiency can lead to anemia, fatigue, tiredness, weakness, weakened immune function, and impaired brain function. There are two types of iron. Heme iron is the most easily absorbed and utilized form of iron. It's found only in animal foods, but is highest in red meat, dark-meat poultry, organ meats (such as liver), mussels, oysters, clams, and sardines. Non-heme iron is found in both animal and plant foods. It may be more common, but it's much harder for our bodies to absorb and use. This form of iron is most readily found in beans (legumes), seeds, greens, and dried fruit. To help the body be able to use non-heme iron more readily, combine these foods with foods high in vitamin C (strawberries, bell peppers, citrus fruit, etc) or other acids (vinegars, tomatoes, etc). Try using cast iron pots and pans in your cooking. This will naturally add iron to your food. Also, Stinging Nettle (Urtica doica), Yellow Dock (Rumex crispus), and Dandelion (Taraxacum officinale) are a few herbs that have a great iron content. Try brewing a nourishing infusion with these herbs. Iodine is essential for proper thyroid function. This may seem like a trivial thing, but the thyroid controls quite a bit in the human body. Thyroid hormones control body growth, brain development, bone maintenance, metabolism, and helps regulate quite a few reproductive processes. Low iodine may even be related to fibromyalgia, dry skin, reduced alertness, and certain cancers. Iodine is found in every food source, however it's typically found in very small quantities. However, good sources of iodine can be seafood, raw dairy and eggs, and seaweed. Several countries have added iodine to table salt as a way to fight iodine deficiency. Since iodine is found in the soil, if the soil is low in iodine the crops grown in that soil will be low as well. It's hard to determine what may be a good vegetable source for this nutrient because of this. However seaweeds and algae such as Spirulina, Bladderwrack (Fucus vesiculosus), and Kelp (Saccharina latissima) can go a long way to supplement your iodine intake. Vitamin D is a fat soluble vitamin that is produced out of cholesterol in the skin when exposed to sunlight. Vitamin D is essential for bone strength, immune function, brain health, and healthy moods. Since this vitamin is synthesized in our own bodies, you'd think we wouldn't have problems with deficiencies, however this deficiency is one of the highest in the world. There are quite a few factors in this. Scientists and doctors say that we only need 20 minutes of sun exposure for our bodies to make all the vitamin D we need, but even if we stay out in the sun, we don't get that sun exposure. We use sunblock which actually keeps us from absorbing the correct UV light that we need for the synthesis of vitamin D. Our sun exposure needs to be unprotected to get the right amount of UV. Also, our bodies need calcium and magnesium in order to properly use vitamin D, since these two nutrients are also common deficiencies, this makes it really hard for our bodies to use vitamin D correctly, and puts us at risk of calcium and magnesium deficiencies on top of that. While we do make this vitamin in our own bodies, there are some food sources. One of the best sources of vitamin D is mushrooms. These little fungi also synthesize vitamin D by using sunlight. This makes the vitamin D found in mushrooms more readily available for our own bodies to use. We can also find vitamin D in dairy, eggs, and fatty fish (salmon, mackerel, sardines, etc). It's very difficult to get sufficient amounts of vitamin D through diet alone. Try going outside, in direct sunlight, without sunscreen, for 10 minutes a day. You can also increase the amount of vitamin D found in your mushrooms by exposing them to direct sunlight for up to 30 minutes before you cook them. Calcium is super important for bone growth, development, and health. But not only that, calcium is used all over the body, as a signaling molecule, allowing our heart, muscles, and nerves to function correctly. It also helps regulate the acid in our digestive tract. Excess calcium is stored in the bones, and when our diets are low in calcium, our bodies remove the calcium stored in our bones. This is why the number one symptom of calcium deficiency is osteoporosis. Other symptoms include severe muscle cramps, and abnormal heart rhythm. Dairy is one of the best known sources of calcium in the diet. However, dark leafy greens, boned fish, wheatgrass, the pith of citrus fruits, and carob are also good sources of calcium. Horestail (Equisetum arvensis), Oatstraw (Avena sativa), and Nettle (Urtica doica) are good herbal sources of calcium. However, calcium is fairly hard to extract, so using these herbs to make a nourishing infusion may be the best way to use them for calcium supplementation. Folate is a major nutrient. It aids the formation of red blood cells, the replication of DNA, and the breakdown of both protein and amino acids. However the most critical role this nutrient takes is in the early stages of pregnancy. Folate is essential in the early formation of the embryo, even before most women know that they are pregnant. This is why women who are trying to conceive should be taking folate supplements. Several studies have shown that women with folate deficiencies are much more likely to give birth to children with brain defects. One of the most commonly known sources for folate in the diet are dried beans (pinto, kidney, soy, lentil, etc). You can also find decent amounts of folate in green leafy vegetables and nutritional yeast. Herbs can also be a great source of folate. Nettle (Urtica doica), Red Clover (Trifolium pratense), and Oatstraw (Avena sativa) are three herbs high in this nutrient. Try consuming a nourishing infusion made with these herbs to help boost your daily intake. I hope this brings awareness to you and your family. If you have any questions or comments please leave them below.